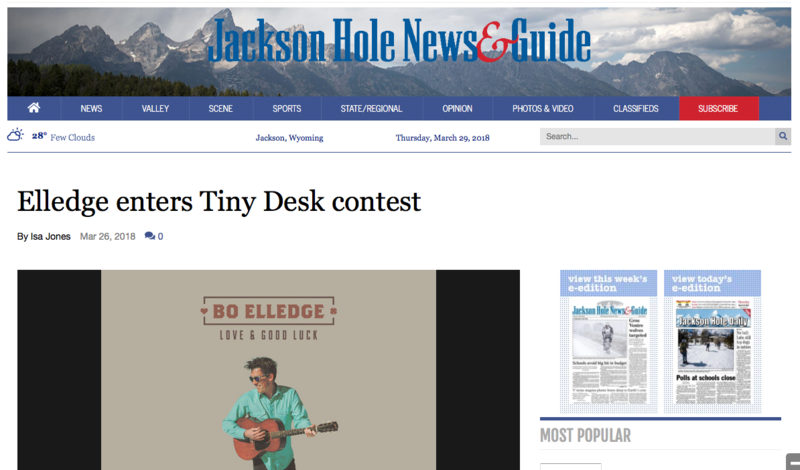 Super excited to be voted one of the best working musicians in Jackson, Wyoming! "Because of Jackson’s relative isolation, Elledge said it’s hard to feel a part of any broader musical scene, but at the same time he’s aware of the incomparable opportunities this outlying location provides. They’re one of the few folk-rock bands in Wyoming and open for many of the national touring acts that pass through. “And if you’re doing that enough, and getting paid to make music, I think you’ve made it,” Elledge said." "Bo Elledge, lead singer for Canyon Kids, has been spending the ski season playing solo acoustic shows in the lobby of Anvil Hotel and filmed his entry there with Shawn Flemming and Chris Polk. While Elledge just released his first solo EP, "Love and Good Luck," his choice for the entry is a new one titled "Stint."" "“Let’s Get It” seems like it’s going to be a country track at first, but looks can be deceiving, as the song’s energy kicks in quickly and transforms it into something unique, and intriguing. Fluttery, light, and catchy, the sound envelopes you as Bo lets you into a snapshot of his world. “Let’s Get It” is a great song to unwind to after a long day, or a long night. 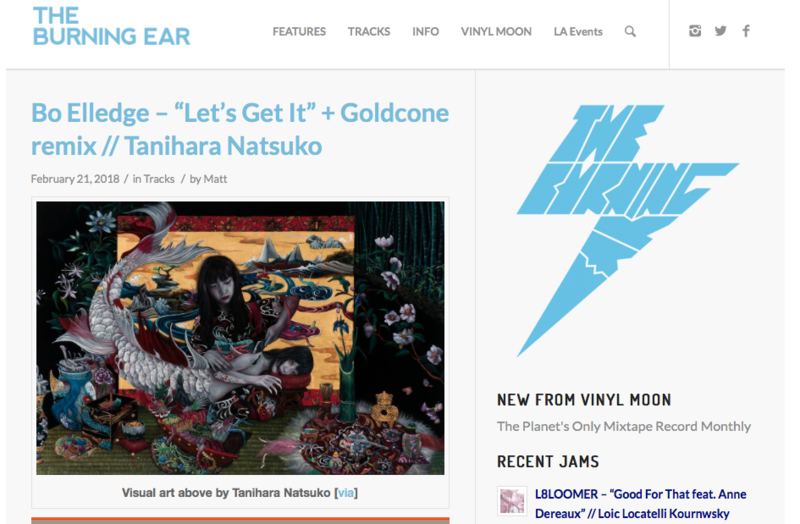 And when you are ready to wind back up, get into this fantastic Goldcone remix. Double the fun. Double the trouble." "We know Valentine’s day was last week and we haven’t completely ignored it. 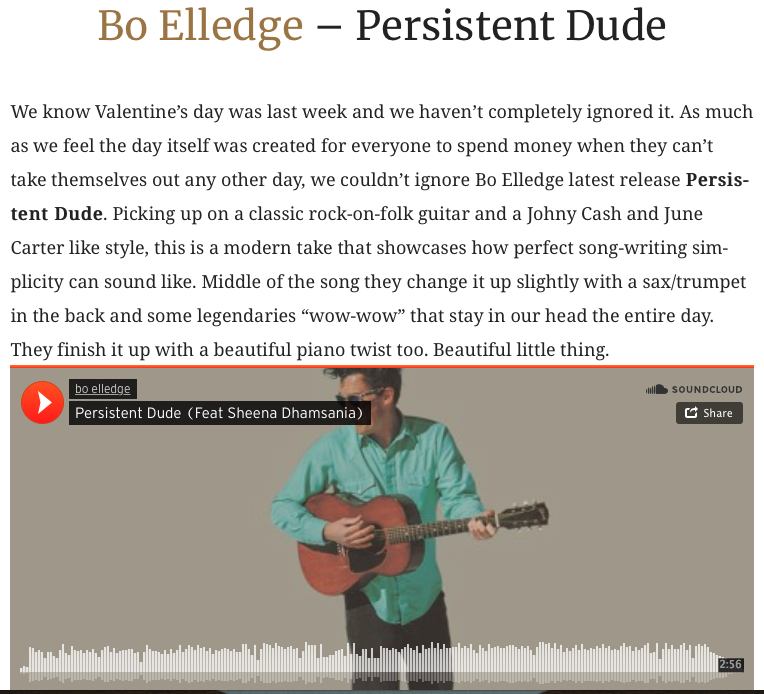 As much as we feel the day itself was created for everyone to spend money when they can’t take themselves out any other day, we couldn’t ignore Bo Elledge latest release Persistent Dude. Picking up on a classic rock-on-folk guitar and a Johny Cash and June Carter like style, this is a modern take that showcases how perfect song-writing simplicity can sound like. Middle of the song they change it up slightly with a sax/trumpet in the back and some legendaries “wow-wow” that stay in our head the entire day. They finish it up with a beautiful piano twist too. Beautiful little thing." "Canyon Kids frontman and guitarist/percussionist Bo Elledge has dedicated the better part of the last decade to song craft. He’s a persistent dude. 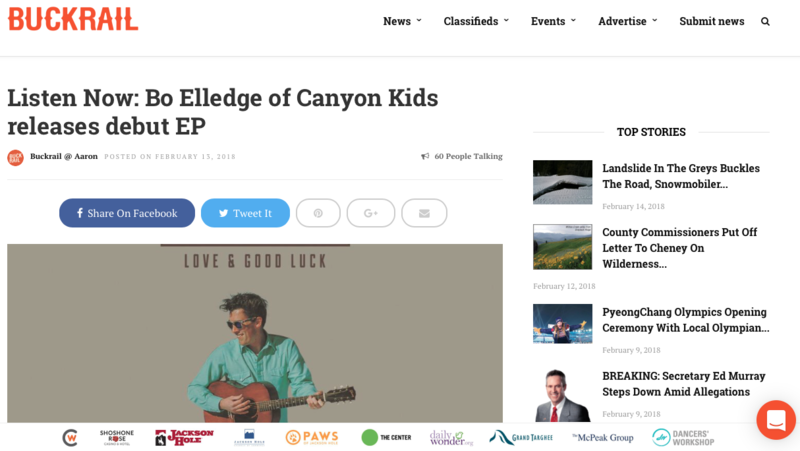 Along with bandmate Dusty Nichols, Elledge has co-penned albums for Canyon Kids—a self-titled in 2014 and the borrowed poetry of Best Loved Poems of the American People in 2016—as well as a seminal Jackson Hole album from the duo’s first local project as Elk Attack, Second Born, in 2012. Canyon Kids released the seven-track Leviathan last summer. Aptly on Valentine’s Day, Elledge drops his debut solo EP, Love & Good Luck. Buckrail gained access to stream the release a day early, so enjoy the stream above"
"A barefoot Bo Elledge took to the Silver Dollar Showroom stage Sept. 23 to perform with Dusty Nichols as the Canyon Kids band, the featured act for last week’s Songwriter’s Alley. On Friday, however, Elledge will appear as a one-man band at Town Square Tavern. During Canyon Kids’ second song Sept. 23, Elledge’s smooth, effortless vocals and rhythm guitar picking morphed into something else entirely as he just as effortlessly — and seamlessly — began playing four instruments simultaneously: guitar, kick drum, tambourine and harmonica." Featured on NPR's "Here and Now"! 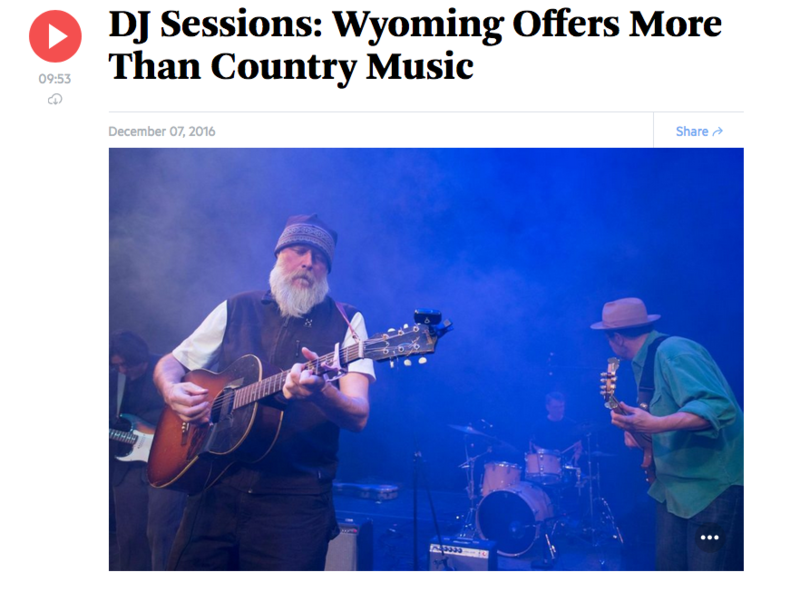 "Wyoming loves its cowboys, but the music scene offers much more than country. Local artists are celebrating soul, funk, rockabilly and everything in between."